The Prince's secret love child! Shocking news has rocked the Mediterranean principality of Agon. 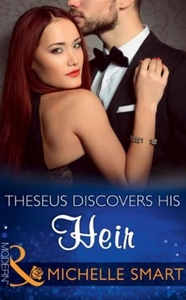 Prince Theseus - second in line to the throne - is rumoured to have fathered a secret love child. Reports surfaced the moment stunning royal biographer Joanne Brooks was hired to memorialise King Astraeus's reign. But it seems she's brought more than pens and paper! Witnesses suggest that five years ago our one-time bad boy Prince travelled the world in disguise and met Joanne Brooks as engineer 'Theo Patakis'. This reporter wants to know how Ms Brooks will react when our commanding Prince wants to claim his child and his bride!